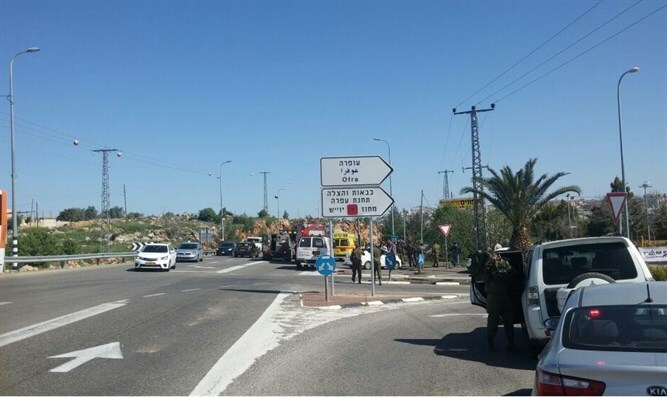 20-year-old Israeli murdered and another youth injured after a car terror attack near Ofra. Terrorist neutralized and arrested. A 20-year-old Jewish youth was murdered this morning in a car-ramming terror attack on Route 60 at the Ofra Junction in the Binyamin region. IDF forces, Border Police and MDA medics rushed to the scene. The injured youth was evacuated to the hospital as he suffered from leg injuries. The Arab terrorist was neutralized by IDF forces, arrested and taken in for investigation by Shin Bet security forces. MDA medic Ilan Klein said that "we're talking about a difficult incident, a youth around 20 years old was lying unconsciously at the bus station; he was without pulse, not breathing and suffered from a severe injury. We tried to administer medical aid but were finally forced to confirm his death." "Near him lay a youth around 20 years old who was conscious and suffered from limb injuries. Together with an IDF medical team that arrived at the scene we administered aid to him, and he was evacuated with light injuries, fully conscious, to Hadassah Hospital at Mount Scopus," he added.